Sometimes all that a person needs to successfully use a computer is less typing! WordPsychic is word prediction software that reduces the amount of typing required to enter text into any Windows-based program. It does this by predicting the word you are typing as you type. After entering each letter, a new list of predicted words is displayed. When you see the word you want in the prediction list (see the above image), just click on it or type the number in the upper right corner. Your word will be inserted into your sentence automatically. Using word prediction can reduce the amount of typing required to enter text in half. 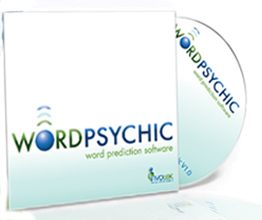 WordPsychic is software that predicts the word you are typing while you type it. It enables you to create text without having to type all of it, which is helpful to people who type very slowly because of physical limitations. The software learns the words you use and gets better at predicting these words over time. Using this software can reduce the number of keystrokes required to produce text by approximately 50%, which can reduce the physical fatigue of writing. The disadvantage of word prediction software (all word prediction, not just WordPsychic) is that reading the words in the prediction list splits your attention when you are writing. Because of this, most people are not faster at entering text when using word prediction software. Here’s how WordPsychic works: WordPsychic uses a sophisticated and modern language model that predicts quickly, saving you keystrokes. It also learns the words you use and how you use them, so the more you use it the better it predicts! The word prediction toolbar illustrated above sits at the top of the screen and doesn't allow other programs to get behind it. Thus, there is no need to move it. There are six words available in the prediction list. The first icon on the toolbar (labeled F5 above) provides access to the options for word prediction. Clicking on this icon brings up a tools menu that enables the user to exit the software, make modifications to the user dictionary, and adjust options such as using an on-screen keyboard and editing the offensive words list. The "Man" button tells WordPsychic not to help with typing, which keeps it from interfering when entering website addresses or telephone numbers. The "Undo" button removes word last inserted and restores the prefix typed by the user.